Students from multiple Ashland County schools recently came together to pack hundreds of bright orange buckets with items they hope and pray will never be used. The STOP THE BLEED buckets will be placed in all 925 classrooms throughout the county. The kits could help in a life-threatening situation, such as a school shooting. "We don't want to be naive and unprepared, so that's our reason behind them," said Linda McKibben from the Ashland City School District. The buckets contain medical supplies that could help control bleeding such as gauze sponges, bandages, gloves and tourniquets. Siblings Emma and Jacob Packard were among the students who filled up the buckets. "They were for being prepared for shootings in case that would happen and be able to stop the bleeding, because a lot of people only died because they bled out," Emma Packard said, referring to school shootings in other parts of the country. "I think it's kind of a good idea because even though you may like shut the door and barricade and stuff, they could still shoot through," Jacob Packard added. The buckets also include door stoppers, ropes and duct tape, which could be extra safeguards in a barricade situation. The idea came from Dr. Mary MacDonald, a surgeon at University Hospital Samaritan Center, after she learned about the project at a conference and passed it along to Ashland County community leaders. The kits are not meant for the kids to use, but hundreds of teachers will be trained later this month by hospital workers and firefighters. 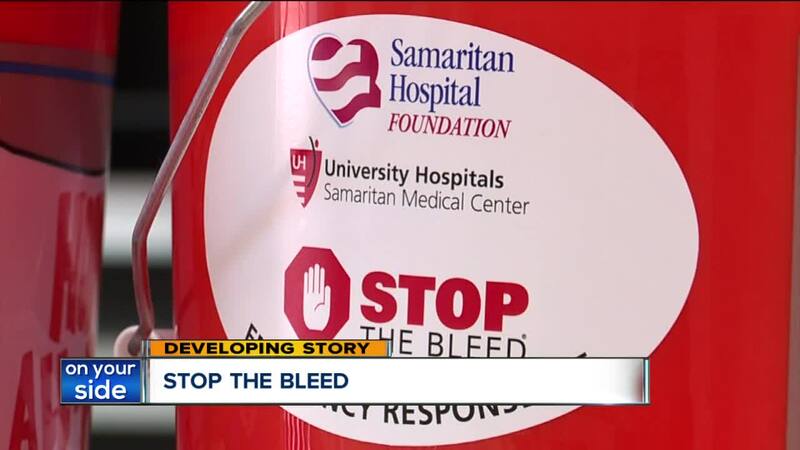 "It's called STOP THE BLEED because we understand these people aren't trained professionals, and it's to try to give them the skill set where they feel comfortable to at least try and stop the bleeding if they can," MacDonald said. The Samaritan Hospital Foundation and University Hospitals Samaritan Medical Center helped pay for the cost of the buckets.